It is important for people with diabetes to understand what foods consist of so that blood glucose levels can be well managed. Food is divided into 5 main groups from which we need to eat from daily. This section details the main food groups and details a selection of foods within these groups to make managing your diet easier. Non-starchy vegetables are vegetables with a relatively low carbohydrate content per 100g. 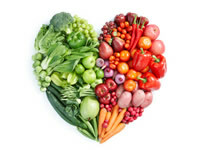 As a guide, vegetables with 5g or less of carbohydrate per 100g of weight could be defined as a non-starchy vegetable. Non-starchy vegetables are a very healthy food group which meals should be based around. Non-starchy are low in carbohydrate and calories but rich in fibre and many nutrients which keep our body in great shape. The American Diabetes Association (ADA) recommends that non-starchy vegetables should make up half of your plate’s contents at main meals. Similar to vegetables, fruits are also rich in nutrients and fibre. Fruit can also be rich in fructose, which raises blood sugar levels quickly, so people with diabetes may find that certain fruit is better for their blood sugar levels than other fruits. The ADA recommends a small piece of fruit as a healthy dessert option. Starchy foods include starchy vegetables and whole grain foods. The ADA recommends that a quarter of main meals are made up of starchy foods. Starchy vegetables are vegetables with a relatively high carbohydrate content. Starchy vegetables can be a good source of fibre and other nutrients. Whole grain foods are starchy foods made from grains such as wheat, barley, oats, maize and brown rice. In unrefined, whole grain form, the grain has three parts to it, the germ, the endosperm and bran. The germ and bran carry much of the nutrients and fibre which is why whole grain foods are much more healthy than refined versions. The key to spotting whether a food, such as bread, pasta or rice, is whole grain is to check whether it has a significantly higher fibre content than white versions of these foods. High protein foods include poultry, red meat, fish, beans and eggs. The ADA recommends that a quarter of main meals is made up of high protein foods which includes meat, fish, beans and eggs. Lean meat is meat with a relatively low fat content and therefore a lower calorie content too compared with non-lean meats. Examples include skinless chicken and pork chops with the fat trimmed off. Lean meats are a good source of protein which the body needs to build and repair body tissue. Protein can also be turned into glucose if the body requires more energy. Red meat is another good source of protein. If red meat has a relatively low fat content, it can also count as lean meat. Recently, red meat has attracted headlines for being linked with health problems including type 2 diabetes and colorectal cancer. It is important to note though that it is predominantly processed red meat that has been linked with the health concerns. Fish is another good source of protein and also contains a good source of omega 3, an essential fatty acid which aids brain function. The NHS recommends eating two portions of fish a week, with at least one these portions being of oily fish, such as salmon, mackerel and sardines. Eggs, beans and pulses are good sources of protein. Eggs are a good source of choline which benefits the brain as well as reducing inflammation. Beans and pulses make for a low fat source of protein whilst also containing useful minerals such as iron. Dairy produce is derived from animal’s milk. Dairy foods contain a good source of calcium and protein. Dairy products can contain a significant quantity of fat which can add to our calorie intake, however, low fat version are widely available for those that wish to reduce the fat and calorie content from their dairy intake. The ADA recommends taking in around half a pint of milk a day. Desserts and sweets are nice to eat but aren’t often so good for blood glucose levels so sweets and desserts are best limited to smaller quantities or for having less often. However, there are other ways to enjoy desserts without risking a jump in blood sugar levels. Fruits such as berries can be had for dessert and cake recipes can be cleverly adapted to replace wheat flour with almond flour and some sweeteners can be used in place of sugar.